Even if this not new as I wrote about this very issue as early as June 2008, the additional research bring us more data on how renewables – and especially biofuels – need much more land to generate energy than traditional solutions. 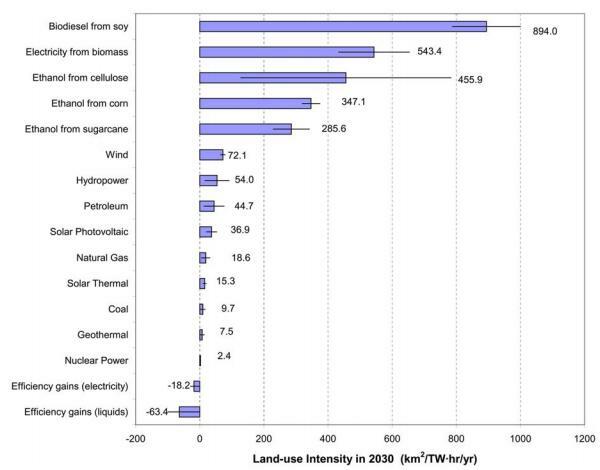 As you can see with the graph biofuels are by far the least efficient solutions in terms of space used per TWh. The most efficient and sustainable ones are nuclear and energy efficiency as it enable to decrease the space needed. To bring a TWh per year wind energy needs 72 square kilometers, hydro 54 ; solar photovoltaïc 36.9 ; solar thermal 15.3 ; geothermal 7.5 and nuclear only 2.4. This means that wind energy needs 30 more space than nuclear to generate the same amount of energy, hydro 22 times more, solar PV 15 times and solar thermal only six times more. Geothermal also sounds a good solution as it needs only three times more space than nuclear. Wind energy is not much of a problem as we can still put the turbines off shore, and this is even more feasible a solution with the new floating wind turbine. Efficiency can decrease this amount of space more or less drastically whether it is applied to electricity (saves 18.2 square kilometers per TWh) or liquids (saves 63 square kilometers). This brings us another reason to work as much as we can on energy efficiency. Our planet is finite and more space will be needed to accommodate and feed the extra billion people expected by 2050. So this is to me another reason to push intelligently nuclear energy.